Bruce Rauner charged his challenger with dodging questions as well as taxes, but J.B. Pritzker lashed back that the Illinois governor was actually living in “a state of denial” in their third and final televised debate Thursday night ahead of the Nov. 6 election. Their head-to-head debate on WGEM-TV in Quincy was their only one taking place outside of Chicago, but was streamed live online. When Pritzker remained consistent on refusing to set figures for a progressive income tax, saying it had to be negotiated between Democrats and Republicans in the General Assembly and put to a public referendum, Rauner said, “Mr. Pritzker dodges questions like he dodges his taxes,” a reference to the $330,000 tax break Pritzker earned on a mansion. Rauner appeared to be knocked off balance with the opening question, even though it was one he should have expected in Quincy: on the repeated outbreaks of Legionnaires’ disease at the Illinois Veterans Home. “I am sorry for your loss. It is deeply painful,” he told families of the more than a dozen people who died there. “No one’s perfect,” he added, while insisting that replacement of the entire plumbing system was underway. He attacked the “so-called criminal investigation” opened by Attorney General Lisa Madigan on the matter as “a political ploy,” a “shameful abuse of power,” and “a sham,” charging Pritzker with “politicization of the suffering of our veterans.” But Pritzker only said that he was “absolutely” committed to “finishing the job” in renovating the home and keeping it in Quincy. Pritzker came loaded with a response as well, calling it “the height of corruption” when Rauner “put your personal and your business and your political interests above the interests of the people of the state of Illinois,” as at the Illinois Veterans Home and in Rauner’s part ownership of the Sterigenics firm causing a “cancer cluster” in Willowbrook and surrounding suburbs west of Chicago. 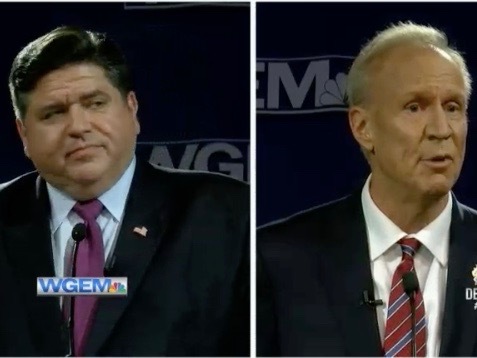 They clashed on business interests, with Rauner saying, “We are hostile on taxes and regulation,” and predicting an imminent “sound of businesses getting flushed down the drain.” He said he’d raise the minimum wage, but only if combined with business deregulation. Pritzker pointed to how Illinois lost 72,000 college students to the instability in higher education brought on by Rauner’s two-year budget impasse with the General Assembly, and that research shows 70 percent of those students don’t return to Illinois. Rauner indulged in a few outright lies, calling it “baloney” that state Sen. Andy Manar of Bunker Hill had led the way on reforming the state school funding formula — a bill he sponsored — and saying that workers in Wisconsin earn more than those in Illinois — proven just the opposite in a recent Midwest Economic Policy Institute study. He repeated what the Better Government Association said was a lie: that the middle class would be “crushed” by a progressive tax system. And he repeated his line from earlier this week blaming “illegal immigration” for causing the unemployment that led to increased gun violence in Chicago, Peoria, Springfield, and other urban centers, in that “violence gets driven by unemployment.” Pritzker countered by saying that Rauner’s cuts to mental-health centers, substance-abuse treatment, and, yes, job-training programs had led to the unemployment that prompted gun violence. Pritzker also slipped in that he would work to bring “high-speed broadband everywhere in the state of Illinois,” calling it a key to economic development. According to WGEM-TV’s Gene Kennedy, fringe candidates Grayson “Kash” Jackson of the Libertarian Party and state Sen. Sam McCann of the Conservative Party did not meet the minimum polling support to qualify for the debate. The election now goes to voters across Illinois to be decided on Nov. 6.